1.Microsoft SQL Server 2012 Analysis Services (SSAS) delivers online analytical processing (OLAP) and data mining functionality for business intelligence applications. 2.Analysis Services supports OLAP by letting we design, create, and manage multidimensional structures that contain data aggregated from other data sources, such as relational databases. 1.Ease of use with a lot of wizards and designers. 4.Provides integration of administration tools, data sources, security, caching, and reporting etc. 3.What is the need for SSAS 2012 component? 3.Data Mining Extensions (DMX) - an industry standard query language oriented toward data mining. 5.What is the difference between a derived measure and a calculated measure? The difference between a derived measure and a calculated measure is when the calculation is performed. A derived measure is calculated before aggregations are created, and the values of the derived measure are stored in the cube. A calculated measure is calculated after aggregations are created, and the values of a calculated measure aren’t stored in the cube. 6. What is FASMI ? A partition in Analysis Services is the physical location of stored cube data. Every cube has at least one partition by default. Each time we create a measure group, another partition is created. Queries run faster against a partitioned cube because Analysis Services only needs to read data from the partitions that contain the answers to the queries. 8. What are the roles of an Analysis Services Information Worker? 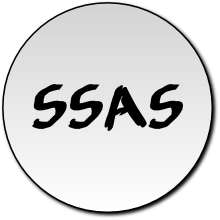 9.Explain the TWO-Tier Architecture of SSAS? 10. How many types of dimension are possible in SSAS?